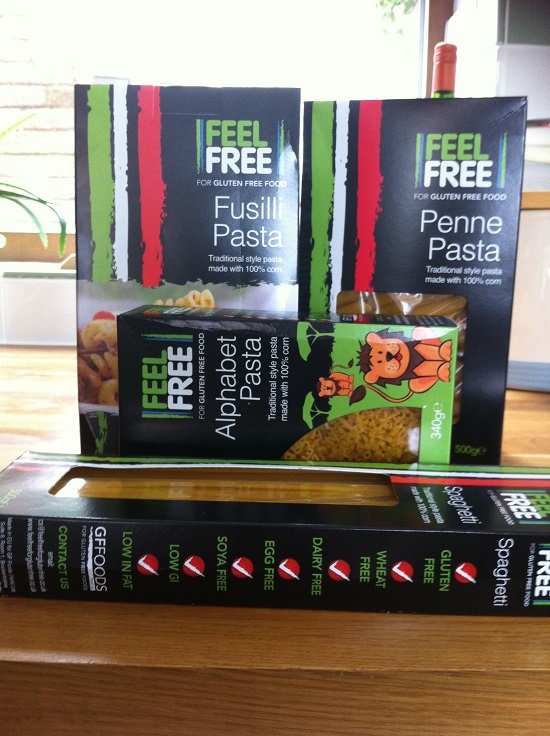 This month I have been trying out the new gluten free pasta from FeelFree and I’ve been impressed. It’s made with corn so unfortunately not suitable for those of you with a corn sensitivity or allergy but that is all it contains. It’s just corn and water. So simple and yet it cooks really well so anyone with a wheat allergy, gluten sensitivity of coeliac disease should give it a try. Gluten free pasta is getting better and better. Gone are the days when you lifted to lid to find a congealed mess of slop which ended up down the drain, inedible and disappointing. This pasta is quick, easy to cook and has turned out reliably good pasta each time we’ve cooked it which is at least five meals. They do a whole range of gluten free products and the pasta is also dairy, soya, egg and nut free. I’ve tried the penne and the fusilli and have yet to try out the spaghetti. I’m waiting for a special visit from my neices to try the the alphabet shapes. To cook, boil a pan of water, then add the required amount of pasta. Salt to taste and add a tablespoon of olive oil. Simmer for about 8-10 minutes. Check the pasta is done by tasting, then drain and eat. If you have leftovers, add another tablespoon of olive oil to drained pasta in the pan, stir so all the pasta is coated. This will give you tasty left overs which don’t stick together. Remove from the hob once cooked too, if you leave gluten free pasta on a warm hob it has a tendency to stick together, though even if it does you can prize it apart and make a lovely cold pasta salad. 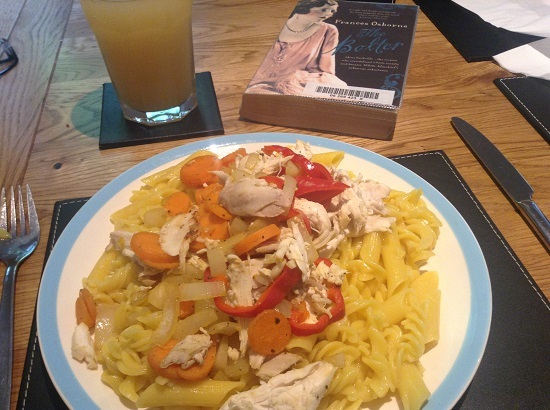 This is what we had for tea last week, chicken stir fry with a mixture of both penne and fusilli as I just couldn’t choose. Husband-who-can-eat-anything cannot tell the difference and is quite happy to eat this so we don’t need to have two pans of pasta on the go. To find out more visit http://feelfreefoods.co.uk/ and to buy visit Budgens, Sainsbury’s or Holland & Barrett. Hopefully more shops will stock them soon, and you can also buy online.